Channel our Modern Muse and get a jump start on the Tuxedo look of Fall with a Spring short suit in off-white. 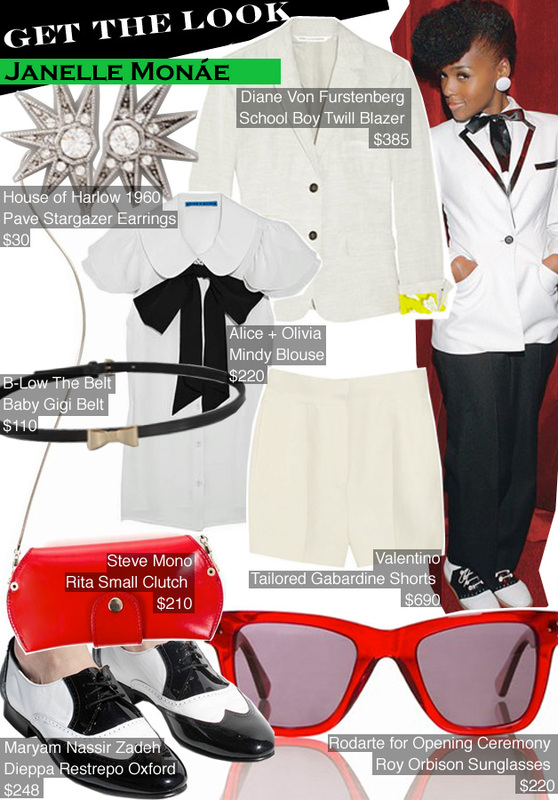 Paired with black/white combinations and red accessories, this look will certainly stand out in the crowd. Mixing white and off-white is fresh for the season and the neon cuffs on the blazer add a touch of edge to Janelle’s usual black/white combo. Don’t forget the bow elements to make it a little more feminine and add the little star earrings add the perfect touch of glamour. Buy bow tie blouse here. I got this web site from my buddy who informed me about this website and now this time I am browsing this site and reading very informative articles or reviews here.